Selangor, Malaysia, July 21, 2014 - (ACN Newswire) - People who recycle, those with car park problems at work or who have used urban rail transport systems somewhere else are more willing to pay for monorail services in Penang, Malaysia, according to a study in the Pertanika Journal of Social Sciences & Humanities. By contrast, other variables like age, gender, ethnicity, income, education and personal perspectives on Malaysia's public transportation system are not significantly associated with people's willingness-to-pay for monorail services. 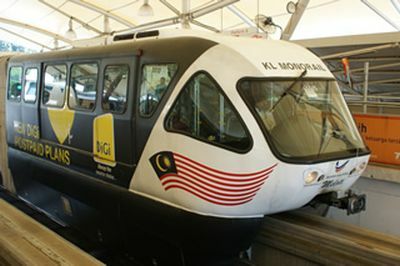 The study, by Y. K. Cheah of Universiti Utara Malaysia and L. Y. Lee of Universiti Sains Malaysia, surveyed a total of 498 respondents, of whom 424 (85%) said they were willing to pay an average of RM 2 for a monorail trip to travel to work, while 74 (15%) were not willing. The study was prompted by Penang's heavy and growing traffic congestion problem. By 2030, it is estimated that travel demand will increase in the Malaysian state by 25-50%. In view of Penang's traffic woes, its government has proposed building a monorail system to alleviate congestion. The purpose of this research was to identify which factors affect an individual's willingness-to-pay for monorail service as an alternative transportation option. Based on their findings, the authors propose various measures to further increase willingness-to-pay for monorail services, including environmental awareness programs on the risks of excessive carbon dioxide in the atmosphere and public information campaigns to promote the benefits of monorails. Due to budget, time and geographical constraints, the survey data was limited to adults who work in the Bayan Lepas area of Penang. The authors therefore recommend surveying people who travel to or from work throughout Penang Island and the mainland in order to obtain a more representative sample. In addition, "students and pensioners should also be examined for their travel patterns and preferences."